This Will Destroy You is one of my favorite groups in the post-rock scene right now. I feel like they’re creating music specifically for me. 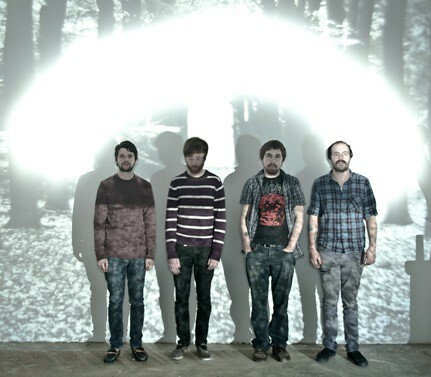 It has the pleasant, sometimes melancholy soft-loud dynamic of bands like Mogwai or Jakob. Yet they’ve taken a turn for the dark side lately. Their new material is ominous, ambient, less guitar-oriented yet still just as destructive. It’s the kind of music you can lose yourself in. There were a couple great moments at their show at the Rock and Roll Hotel this Sunday, where I could feel the full power of their noise assault. But the show just wasn’t mixed right. For an instrumental rock band, nothing is more important than the sound; I was left underwhelmed. This was pretty disappointing, considering their show last year at DC9 was one of my favorites of the year, and I love the material they’ve written since then. Do you like guitars? Do you like noise? Do you want to have your mind blown?! In case you couldn’t guess by the name, the band has attracted a cult-like following (being somewhat of a cult itself). I plan to be indoctrinated on Thursday. Bring earplugs. Crystal Castles is a band I haven’t quite wrapped my head around yet. They’re a duet that plays slightly off-kilter, dark, noisy electronic music. It’s a pretty strange mix of Vegas slot-machine ambience, Gameboy bleeps and bloops, and ghostly vocals. Why do people like this? Maybe because it’s so weird. Or because you can dance to it. But like Apple Jacks, I just like it, and I can’t explain why. Clearly I’m not the only one who feels this way – they sold out the 9:30 Club on Wednesday, just like the last time they came through DC in August. 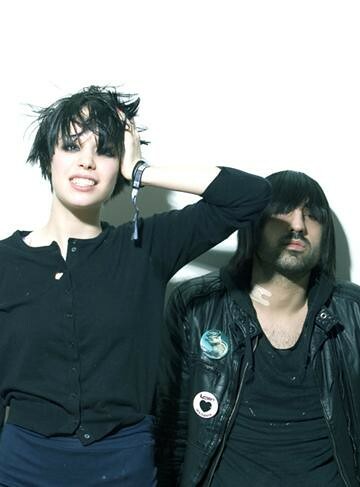 Crystal Castles put on an impressive live show that perfectly complements their music. Not only did they pick a great setlist, but the entire visual aspect of the show perfectly complemented their songs. Bright LED displays surrounded by darkness added a new layer of mystery to their music. And, oh man, their singer Alice Glass knows how to get a crowd going. We danced, jumped, and clawed our way forward throughout the set. If you’re looking for a “unique” experience on Friday night, you can’t do much better than seeing Israeli garage-rockers Monotonix at Comet. Their debut album was a well-received collection of fuzzy riffs and some barely intelligible shouting. 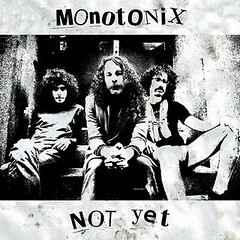 If you like Monotonix but you haven’t seen them live yet, you are a fool. Their music is just background noise for the performance art of their singer Ami Shalev. He jumps off drum sets, asks people to throw garbage at him, and generally causes a ruckus. This man is a tank, taking abuse from the audience (and himself) in show after show. He’s the embodiment of rock ‘n roll excess. After getting banned from every club in their hometown of Tel Aviv, Monotonix has been touring the world almost nonstop since their debut 4 years ago. Right now, they’re touring in support of their new album “Not Yet”. Oh, and Ami recently broke his arm at a show in Florida (I’m shocked that this is his first show-stopping injury), but I can’t imagine this group turning down their intensity for a stupid reason like that. Comet should be the perfect venue to see these guys, as they’ll be right there on the floor with the audience. The openers Federation X and Pujol from Nashville bring more garage-rock flavor to the bill. Monotonix probably invited them just to have more people to help clean up after their set. Something happened at Black Cat on Tuesday night that I was completely unprepared for. I thought I was set. 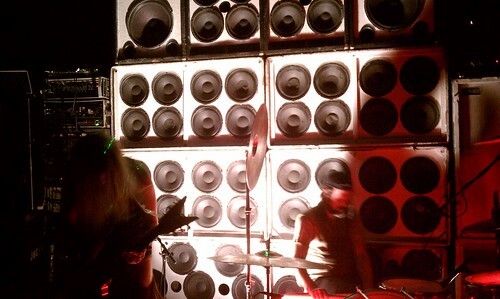 I took one look at Jucifer and their wall of speakers, and I knew it was my kind of music. I’ve seen drone-metal bands like Sunn O))) before. I listened to Jucifer’s latest album and knew I’d enjoy that sort of American black metal in person. I brought my nice earplugs, designed for drummers who play for hours straight. But, my God, I was not expecting to have such an amazing metal night. This band Jucifer already intimidated me with their wall of white speakers. Even their first note was super-loud, enough to make me desperately shove in my earplugs and cease any coherent conversation with my friends who had invited me. Once their set began, I was completely enthralled with the noise they created.